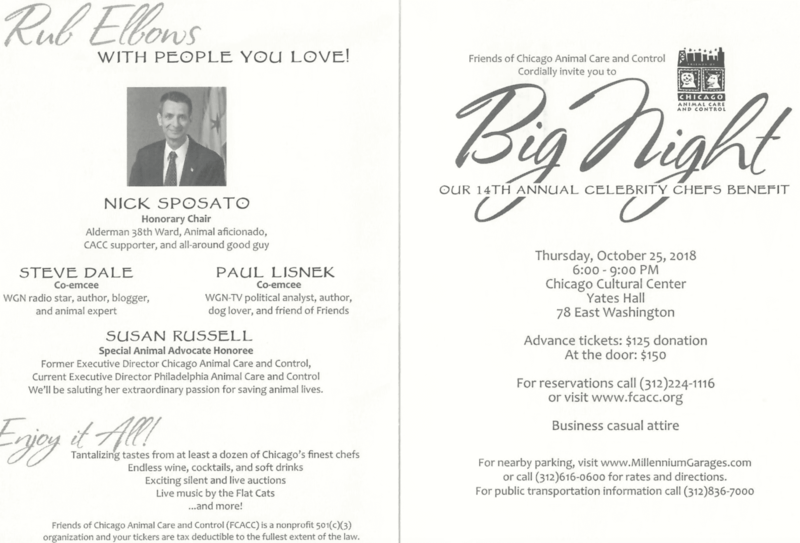 It’s a Big Night for Friends of Chicago Animal Care and Control (CACC). This non-profit helps to support the City’s municipal shelter. This is their most important fundraiser of the year. And you can help to save lives just by eating. That’s right, just as in the movie Big Night, you can stuff yourself, as so many of Chicago’s top chefs will be there at food stations throughout the Chicago Cultural Center, 78 E. Washington St. (at Michigan Avenue) on October 25, 6 p.m. 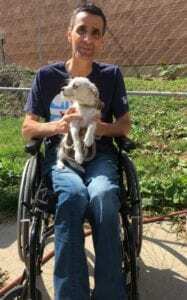 This year’s Honorary Chair is 38th Ward Alderman Nick Sposato, an enthusiastic supporter of CACC and a supporter of saving lives. Sposato not only supports CACC in what he says at City Hall, it’s also what he does – both in his own ward and City-wide to help homeless animals. It’s clear that no alderman has done as much for animals as Sposato. The event includes flowing win and cocktails, and live music by the Flat Cats. There will be all sorts of items available at the silent and live auctions. Susan Russell, outgoing executive director of Chicago Animal Care and Control and is the Special Honoree of the evening. 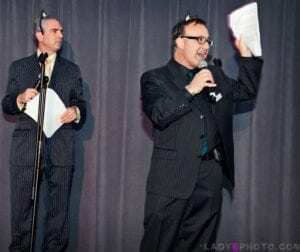 I am again co-emceeing Big Night – as I’ve done many times in the past, however this year I have a co-emcee. My oldest friend Paul Lisnek of CLTV and WGN-TV. I was at Paul’s last birthday party: Let’s just say the candles cost more than the cake. In fact, the candle cost exceeded the deficit of the city of Chicago. Yes, that’s a lot of candles. The fire commissioner had to close down the party. Paul’s latest book “Assume Guilt,” is due out later this month. Purchase tickets for Big Night HERE.